An enlarged prostate probably means you have prostate cancer. The correct answer is myth. 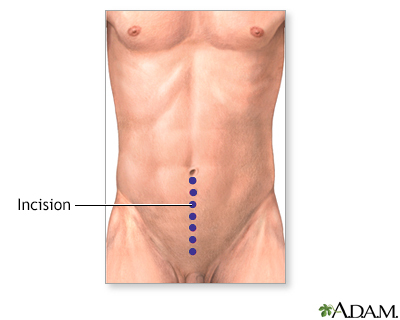 The prostate is a small, walnut-sized gland found next to a man's bladder. It becomes enlarged in almost all men as they age. 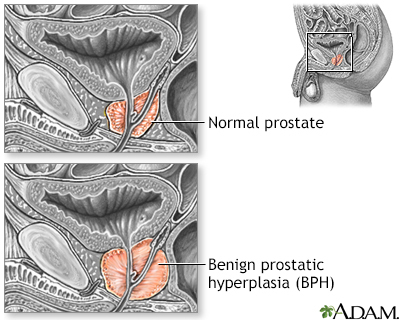 This is called benign prostatic hyperplasia, or BPH. It does not raise the risk of prostate cancer. Which may be a sign of prostate cancer? The correct answer is all of the above, although these symptoms can also be caused by other prostate problems. 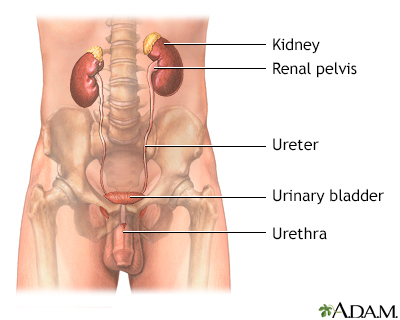 Check with your doctor if you notice any changes or difficulties when you urinate. Many prostate cancers are diagnosed before any symptoms are present. 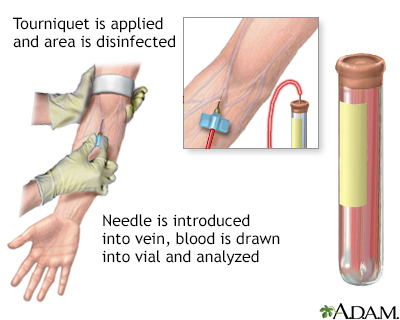 A high PSA (prostate specific antigen) level is a sure sign of prostate cancer. The correct answer is myth. The PSA blood test can help detect prostate cancer, but it's not foolproof. 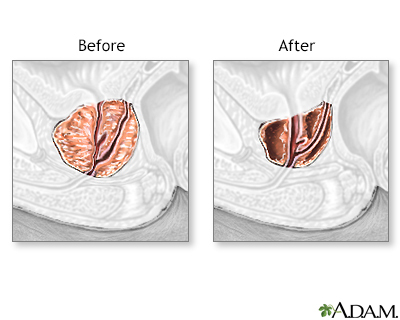 Prostate infections or an enlarged prostate can also cause a rise in PSA. Not all experts agree about the value of using PSA test to screen for prostate cancer. Talk with your doctor about whether you should have a PSA test. Which can raise your prostate cancer risk? The correct answer is all of the above. Let your doctor know if you have any of these risk factors. Men with a family history of prostate cancer (especially a brother or father) and African-American men should consider yearly screenings starting around age 40 to 45. Men younger than 40 rarely develop prostate cancer. The correct answer is fact. Most prostate cancer occurs in men who are older than 60. It's the most common cause of death from cancer in men over age 75. Starting at age 50 (or earlier if you are at higher risk), talk with your doctor about the risks and benefits of prostate cancer screening. A biopsy is the only way tell if you have prostate cancer. The correct answer is fact. 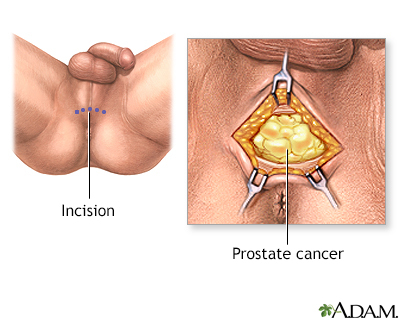 During a biopsy, your doctor will remove some tissue from the prostate to test for cancer. Your doctor may recommend a biopsy if you have a high PSA level, or if a rectal exam shows a large prostate or a hard, uneven surface. The correct answer is any of the above. If the cancer has not spread beyond the prostate, treatment options include surgery, radiation therapy, or both. Brachytherapy involves placing tiny radioactive seeds inside the prostate. It's often used to treat small, slow-growing cancer. Prostate cancer thrives on testosterone. The correct answer is fact. Most prostate tumors need testosterone to grow. In men whose cancer has spread beyond the prostate, hormone therapy may help reduce testosterone levels. This can relieve symptoms and keep the cancer from spreading, but it's not a cure. Prostate cancer should always be treated, no matter your age. The correct answer is myth. If you are older and have a slow-growing cancer, your doctor may recommend simply monitoring the cancer with PSA tests or biopsies. Prostate cancer treatments may cause impotence. The correct answer is fact. Possible problems after surgery or radiation therapy include problems controlling urine or bowel movements and erection problems. Medicines used to treat prostate cancer may also cause erection problems. Prostate cancer can never be cured. The correct answer is myth. Many patients can be cured if their prostate cancer is found before it has spread beyond the prostate gland. Some patients whose cancer has not spread very much outside the prostate gland can also be cured. Even when prostate cancer cannot be cured, many man can live years with the cancer present. Treatment of prostate cancer varies depending on the stage of the cancer (i.e., spread) and may include surgical removal, radiation, chemotherapy, hormonal manipulation or a combination of these treatments.